After years of controversy, a full-size replica of Noah’s Ark opened in northern Kentucky this summer. Answers in Genesis, led by Ken Ham, developed the attraction as a way of promoting their view of Biblical inerrancy from a Christian perspective, and to bolster their argument that the Earth is just 6,000 years old and was created in six 24-hour days. It is also a vehicle for them to spread the gospel, and reassure those who already believe. Jews worldwide will be reading the story of Noah during Shabbat on Nov. 5 — but don’t expect the Jewish perspective at Ark Encounter. With its evangelical slant on what was originally a Jewish story, what should a Jewish visitor make of it — if one decides to go ahead and visit? 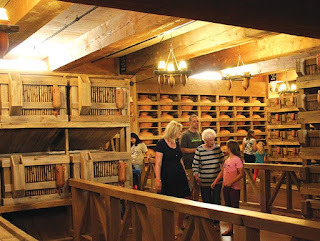 Like the original ark, this replica was built amid controversy. In 2010, Answers in Genesis and Ark Encounter, a for-profit corporation, announced they would build a full-scale replica of Noah’s Ark near Williamstown, Ky., to strengthen arguments that the Biblical account of the ark was true and physically feasible. The park’s opening phase cost $100 million, with $36 million from donations and $62 million from a bond offering by Williamstown. The project also received tourism tax incentives. 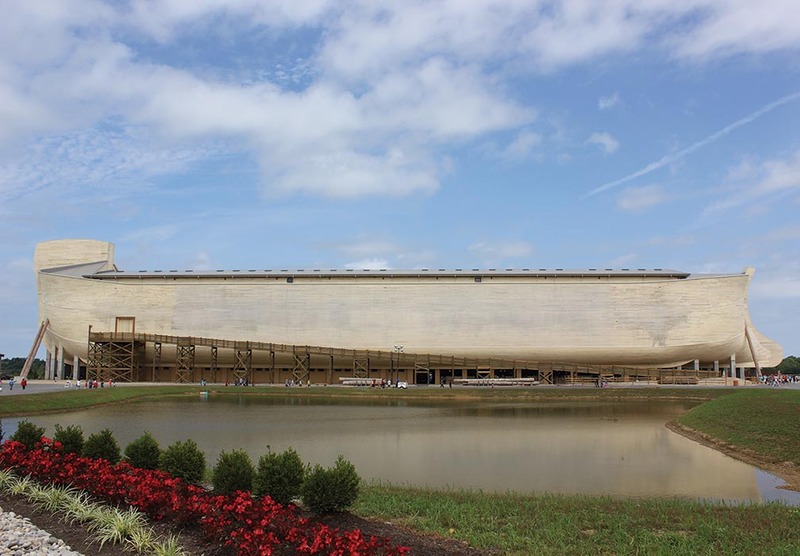 Initially, the state said Ark Encounter was not eligible because of hiring practices that required employees to sign a statement of faith in Christianity, young-Earth creationism, and against homosexuality. The ark sued, and in January a federal judge overturned the rejection, and also upheld the ark’s right to have a religious views test in hiring. The park opened on July 7, corresponding with the verse in Genesis (7:7) where Noah and his family entered the ark. About 30,000 visitors toured the ark during the first six days, according to Answers in Genesis. On opening day, about 150 protestors stood at the Interstate exit ramp to oppose the attraction. Atheist groups and Ham have battled over attendance figures, with opponents showing photos of vast empty spaces in the 4,000-car parking lot, while Ham said attendance in the first month was over 240,000 visits for the ark and his Creation Museum. The museum is located about 45 minutes away, just west of Cincinnati on the Kentucky side of the river. In mid-September, figures for the first nine weeks showed 300,000 visits to just the ark, which Ark Encounter said was well ahead of projections. Atheist groups have also battled with the ark over school field trips, saying the evangelical message is unsuitable for public school trips. Ham responded by offering admission of $1 per student, with teachers free, for schools that want to visit. A one-day admission is $40 for adults, $31 for seniors and $28 for children age 5 and up. Because there is “so much to see” they urge visitors to get a two-day admission or even a $99 seven-day unlimited pass. There is also a combo pack that includes admission to the Creation Museum. They also sell annual passes that includes free parking, which otherwise is $10 per visit (Disclosure: Southern Jewish Life was given complimentary press passes). For the first “40 days and 40 nights” after the grand opening, the park was open until midnight each day in anticipation of large crowds, before settling into its normal closing time of 6 p.m.
After going through the ticket line, one boards a shuttle bus for the one-mile trip to the ark complex. After bring dropped off by the guest services building, there are two paths around a small pond that sits between the bus stop and the ark. Currently, there is a snack spot, the Ararat Ridge petting zoo, Screaming Eagle Zip lines, and Emzara’s Kitchen. Future plans include a theater between the ark and the petting zoo, and a “walled city” by the bus stop. A Tower of Babel is also planned, as a warning against racism. The restaurant is named for Noah’s wife — at least, her presumed name from sources outside the Bible. Future planned food offerings include items like kebabs, but for now the menu at the 1,500-seat Emzara’s is an un-Middle Eastern mix of concession-stand style burgers, chicken fingers, pan pizzas, wraps and the signature dish, a decidedly unkosher “two by two” double cheeseburger. One enters the ark at the other end from the restaurant, filing through a lengthy maze underneath the massive structure while a looped video showing the ark’s construction plays on numerous screens. Filing through the long line can take an hour or so, plenty of time to memorize the video. Church and Christian-slogan T-shirts are definitely in abundance on those visiting. The ark, which sits on a series of concrete pillars — thus the waiting area underneath — is 510 feet long and 85 feet wide. As in the Biblical account, there are three levels inside, and construction required 3.3 million board feet of lumber. At the top of the ramp entering the ark there is a green screen and photographers taking posed pictures of the guests, so they can buy photo packages when they depart. While it may be annoying to think you’ve stood in a lengthy line just to have your picture taken — and once you get up the ramp, you can bypass the photographers — that process does seem to keep the crowds from overwhelming the inside of the ark. 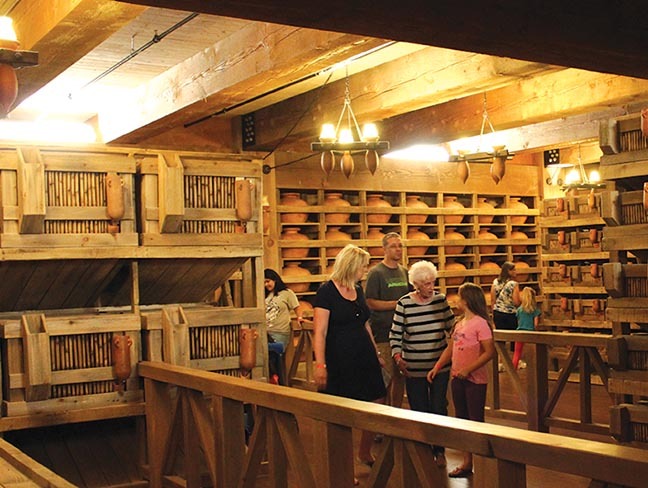 Upon entering the ark on the bottom level, one sees rows of wood cages for smaller animals, rows of clay urns for food storage. A display shows Noah leading his family in prayer at the beginning of the flood. After that, the displays become descriptive, putting forth the attraction’s point of view. A similar argument is made regarding the different kinds of dogs around the world, and how they adapted to their new environments as they spread across the globe. Just don’t call it evolution — call it adaptability, using God-given talents to do so. 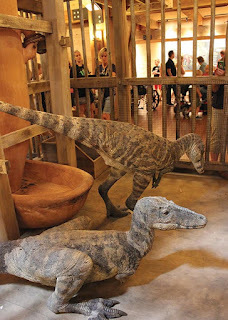 Another item that has been a source of controversy is the assertion by Answers in Genesis that there were dinosaurs on the ark, and many of the cages have types of dinosaurs depicted inside. Young Earth creationists insist that dinosaurs had not died out by the sixth day of creation, when man was created, and they coexisted for centuries. The scientific consensus is that dinosaurs became extinct about 65 million years ago, while the earliest human ancestors appeared about 6 million years ago. Science aside, an immediate objection to dinosaurs on the ark because of their size is also anticipated. As with many other larger animals, the displays argue, Noah did not need full-grown adults, as smaller, younger animals took up less room and would still have plenty of reproductive time ahead of them after the flood. On the second floor, a display recounts the pre-flood world and its excesses. It starts with panels of the six days of creation, then the perfect world of creation — until man messes it up through the “rebellion” of Adam and Eve, leading to the corruption of man’s God-given talents, which were used for evil. The pre-flood section ends with an admonishment that Jesus said the world just prior to his return would be similar to the world just before Noah. Pay no attention to the Zip lines and petting zoo outside, and please exit through the gift shop. Showing a motive for the entire project, Ham has said that if Noah’s Ark isn’t true, then Jesus was a liar, which to him simply can’t be the case. 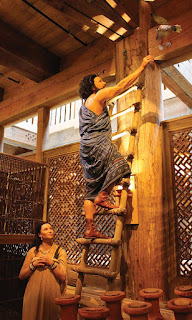 Some exhibits get into more neutral topics, like construction methods, or who Noah was. One panel argues that the Grand Canyon could have been formed in days rather than over eons. Another argues that there was only one ice age, and it came about because of the flood. Nye said every single science display in the ark was “not just misleading but wrong,” and said the Ark is a danger to science education in the U.S. The Ark Encounter does mention that there are dozens of flood stories in civilizations around the world, showing a map with the names of such legends. The ark is also housing “The Voyage of a Book: Personal Stories of Taking the Bible Around the World,” from the Museum of the Bible. The first item displayed is a Torah from 19th-century Persia, open to a section detailing the building of the tabernacle. It sits behind plexiglass on a reader’s table that goes back to 1907 Poland. There is another Torah from 19th century Russia, a case for the scroll of Esther, pages from a 14th-century Karaite prayer book from Cairo and a 1655 London polyglot Bible page in Chaldean, Hebrew, Greek, Syriac, Arabic and Latin. The main emphasis of the exhibit, though, is how individuals took the Bible around the world, to spread Christianity. To do the Ark Encounter, one definitely needs comfortable shoes. The ark measures one-tenth of a mile, and there are exhibits on both sides of each of the three levels, plus long ramps to go from one level to the next, and another set of long ramps to go back down. So, given that the Ark Encounter is an evangelical Christian version of a Jewish story, with plenty of approaches that aren’t taught in Hebrew School, should Jewish travelers make their way to the 800-acre site just south of Cincinnati? If you want to see the structure itself, which is impressive, and know exactly what you’re getting into with how the story is presented, stop by. If you’re a student of comparative religion, this is definitely a viewpoint that attracts its share of adherents. If looking at the displays will annoy you and the idea of giving a dime to a group that espouses this type of ideology sickens you, you may want to spare yourself the aggravation.